The Ford Raptor is an F-150 on steroids and has all the power and speed you need for any off-roading adventures that may come your way. Not just a pretty face, the Ford F-150 Raptor has the muscle and strength to carry you and yours everywhere in style and comfort. New colors are available for the Ford F-150 Raptor, such as the Ford Performance Blue (formerly only on Ford Performance vehicles), the new Velocity Blue and the new Agate Black. 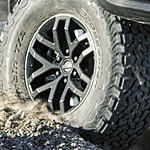 Newly designed KO2 tires from BF Goodrich add style and performance, especially when coupled with the available 4.10 front axle with TORSEN differential capability. The Ford F-150 Raptor leaves no one in doubt as to who it is. From the distinctive and bold FORD lettering on the front grille to the flared front fenders, the Raptor announces itself to all who see it. Power, performance and panache are ever-present in the Ford F-150 Raptor, and we here at Malloy Ford of Winchester are excited to see the new models.